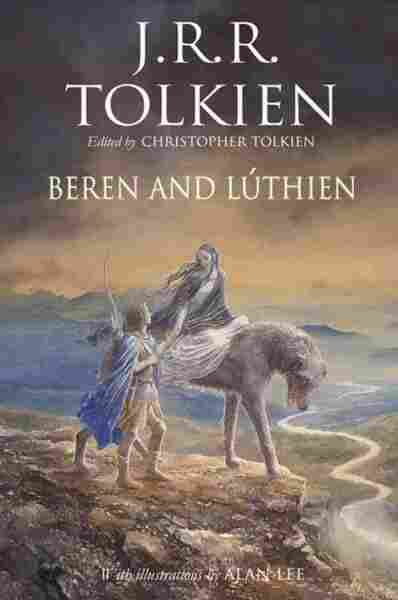 Book Review: 'Beren And Lúthien,' By J.R.R. Tolkien J.R.R. Tolkien's son Christopher proves an able guide through Beren and Lúthien, his father's haunting tale of a mortal man who falls in love with the daughter of a disapproving Elven King. One night in December of 1993, I stood in a frost-bound churchyard in Wolvercote, near Oxford. The tombstone in front of me bore the names of Edith Mary Tolkien and her husband John Ronald, but underneath each name was another: "Lúthien" and "Beren." Young Tolkien had fallen in love with Edith when he was 16 and she 19, but his guardian disapproved (both he and Edith were orphans). They finally married when Tolkien was 24 — just a few months before he was deployed to the Somme. The next year, he began composing the earliest version of a tale to which he would always return: The love of Beren, a mortal man, and Lúthien, daughter of the Elven King of the forest realm of Doriath. The disapproval of Lúthien's father sends the two lovers on a series of perilous quests, but they rescue each other through bravery, music and love — with an assist from a magical dog. I was going to type something like "Elves, true love, magical dog, obviously this tale was written in more innocent times" — but that isn't true. World War I was a meat grinder into which Britain's young men were fed with their eyes open. When Tolkien left for the Somme as a second lieutenant, he wrote that "Junior officers were being killed off, a dozen a minute. Parting from my wife then ... it was like a death." He only survived to write his works because he was struck down with trench fever and sent back to Britain as an invalid. Tolkien came out of that hell knowing what he wanted to write: fairy tales. "I have been a lover of fairy-stories since I learned to read," he later wrote in an essay in which he passionately defended fantasy and "escapist" fiction: "Why should a man be scorned if, finding himself in prison, he tries to get out and go home? Or if, when he cannot do so, he thinks and talks about other topics than jailers and prison-walls?" in their thought's shadow, by no moon lit. Every version of the story in the book is incomplete, but under Christopher Tolkien's steady editorial hand, the fragments assemble themselves to give us an impression of the whole. What makes this possible is the grace with which he handles his long-accustomed dual role of guide to both story and history. His preface and annotations are openhearted and engaging. He leads the reader pleasantly through the greater landscape of Middle Earth in the First Age, and strikes as clear a path as possible through the wilderness of Tolkien's lifelong attempts to get the story finished and published. With eloquence and diligence and care, the son reconstructs and retraces the father's journey, pursuing the tale through draft after draft as Tolkien pursued his vision of Middle-Earth; as Beren, lost and hunted, followed the sound of Lùthien's voice as she sang in the shadowed forest of Doriath. Christopher Tolkien makes it clear that this may be the final time he takes us for a walk through his father's world. "In my ninety-third year this is (presumptively) my last book in the long series of editions of my father's writings," he writes in the preface. "This tale is chosen in memoriam because of its deeply-rooted presence in his life." "The story is gone crooked, and I am left," Tolkien wrote after Edith died, when he decided to have the names of Beren and Lúthien added to the tombstone they would share. But we all leave the world with our story incomplete, our love and work unfinished. We can only hope that what we leave behind will give those who come after us a way to perceive or guess, each in their own mind, the shape of the tale that might have been told. Liza Graham is a mezzo-soprano and writer, born in Washington, D.C., and living in London. She has been a critic and columnist for the Metro papers, as well as a guest blogger at mightygodking.com. Her poetry has been published in Goblin Fruit magazine.